These easy 5-ingredient Cheesy Bacon BBQ Chicken Taquitos are bursting with flavor and perfect for lunch, dinner, a snack, or a party! I love the combination of smoky bacon, sharp cheddar and sweet and tart barbecue sauce with chicken, and it is especially tasty all wrapped up in a crispy corn tortilla. My husband raved about these as well, and he’s an alien who somehow “doesn’t like bacon,” so believe me when I tell you these will be a crowd-pleaser. 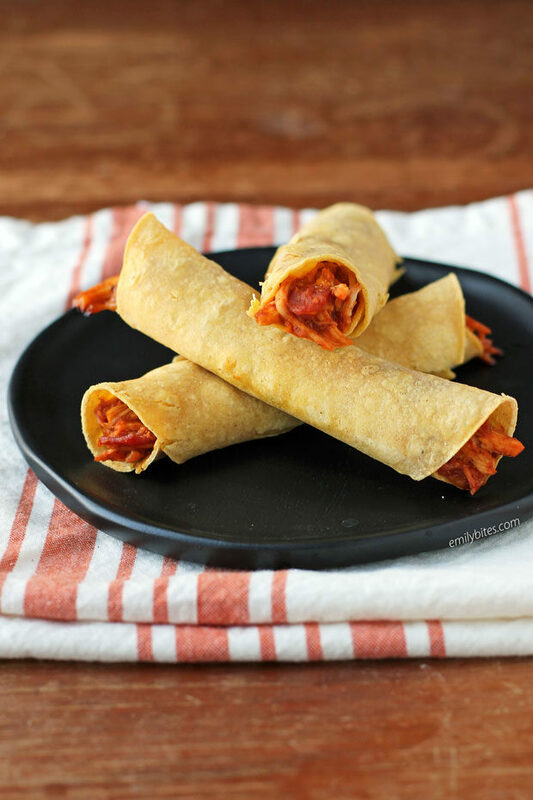 These Cheesy Bacon BBQ Chicken Taquitos are so craveable and just 107 calories or 2 WW Freestyle SmartPoints each! I love using the Mission Extra Thin Yellow Corn Tortillas for these (as well as my Spicy Beef Taquitos and Buffalo Chicken Taquitos) because they taste great, are the perfect size, and are super low in calories/points. I will advise you that using corn tortillas (rather than flour tortillas) will sometimes cause the tortillas to crack/split when rolled and baked in the oven. This means that not all of your taquitos may come out looking perfect, but I know they will all come out tasting amazing! I also just want to mention that this recipe calls for cooked, shredded chicken breast, and you can cook the chicken using a wide variety of methods. I usually make a bunch in the slow cooker to use for recipes, salads, etc throughout the week, but you could also make shredded chicken in an Instant Pot, boiled in a regular pot, or just buy a rotisserie chicken, remove the skin and shred the breast meat. Looking for more tasty lightened up recipes featuring bacon? Check out my Butternut Squash Pasta with Bacon, Barbecue Bacon Wrapped Chicken Tenders, Ultimate Tater Tot Breakfast Casserole, Cajun Turkey Club Sandwich, Slow Cooker Loaded Potato and Cauliflower Soup, Bubble Up BBQ Chicken and Beans Bake, Avocado BLT Pasta Salad, Rustic Sausage and Potato Skillet, Broccoli Salad, Slow Cooker Apple Bacon BBQ Pulled Pork, Zuppa Toscana, BLT Dip, Cheesy Bacon BBQ Chicken, Bubble Up Breakfast Casserole, Bacon-Wrapped Water Chestnuts, Bacon Wrapped BBQ Meatloaf, Bacon Cheeseburger Wraps, Bacon, Cheddar and Beer Risotto, Meat Lover’s Pizza, and many more in the Bacon category of my recipe index! Cook the bacon to crisp according to package instructions. Drain on paper towels and then crumble. 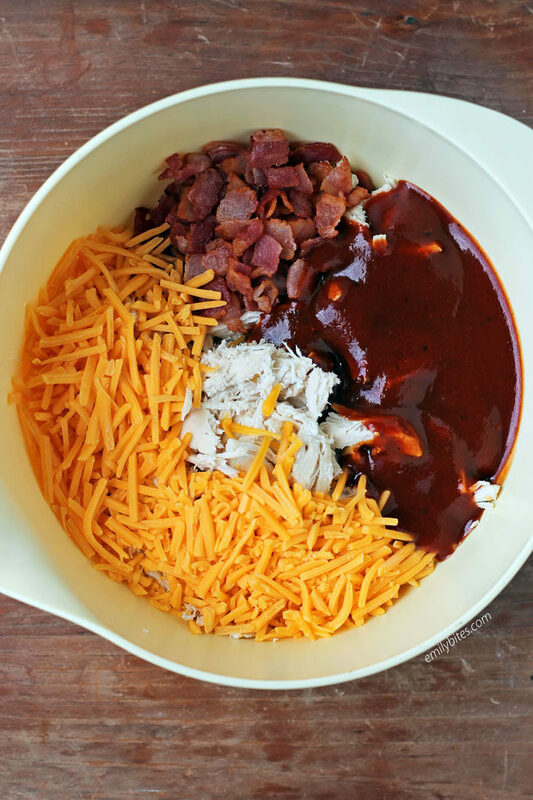 Combine the crumbled bacon, shredded chicken, barbecue sauce and shredded cheese in a mixing bowl and stir together until well mixed. Place about half the tortillas between two damp paper towels and microwave them for 30 seconds until they are warm and pliable. Place a tortilla on a clean, dry work surface and then scoop two generous/rounded tablespoons of chicken filling onto the bottom third of the tortilla. Roll the tortilla up from the bottom to surround the filling and once it’s rolled into a tube, place it on the prepared baking sheet, seam side down. Repeat steps with the remaining ingredients (including microwaving the other half of the tortillas when you get to them). Mist the rolled taquitos with cooking spray.